With no more than 25 individuals of this unique Madagascan tree thought to exist – 21 of them on the site of a proposed mine – Eligmocarpus cynometroides is a species on the very brink of extinction, a prime example of the threatened biodiversity in Madagascar’s littoral forests. Around 96% of Madagascar’s trees and large shrubs are found nowhere else on Earth, but this incredible diversity is under significant threat – 1,676 of the island’s unique vascular plant species are believed to be facing extinction. 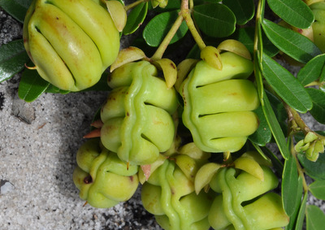 One of the country’s critically endangered trees is Eligmocarpus cynometroides, the only species in one of Madagascar’s 22 endemic legume genera. The present-day Eligmocarpus population is found in degraded littoral forests in the southeast of the island, where Madagascar’s humid, dry and sub-arid biomes meet. Individuals have historically been recorded further inland, with the buoyant, accordion-shaped fruit dispersing along watercourses, but the individuals in the only population still known are isolated on dunes 10m above sea level. This prevents their seeds from dispersing naturally and germinating successfully: seeds soaked in cold water for 48 hours have been shown to germinate nine times more often than those kept on dry land. Eligmocarpus is further threatened by human action. Its dense wood can be used as structural support in houses and in making charcoal, and as a result several of the 27 trees found in the Petriky area in 2001 have since been felled by local communities. No more than 21 now remain, most of which are vulnerable in exposed, degraded habitat near villages. Additionally, Petriky is the site of a proposed ilmenite mine, whose development would certainly have dire consequences for every known individual of this species. While it is unclear whether the felling of individual trees is likely to tip this species into extinction before mining activities commence, the situation is evidently extremely precarious. Eligmocarpus cynometroides needs urgent help if it is not to be wiped out in the very near future. The mpingo tree from Tanzania provides much of the wood used to make high quality clarinets, oboes, wooden flutes and bagpipes.